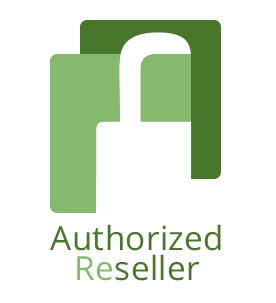 Before you can access your Reseller account, a member of AxCrypt’s team must assign you an administrator role with Reseller privileges. After signing the agreement, our team will ask you for an email address associated with an AxCrypt account. This account will serve as the admin of the Reseller account. Note: It’s perfectly fine if you use the same account in combination with your own subscription plan. Log into account.axcrypt.net to get access to your Reseller account. You see you account as shown in the picture below. AxCrypt offers one subscription for reselling: AxCrypt Business. You can use the sub menus on account.axcrypt.net to manage your existing clients or purchase licenses for your clients. Log in using the existing account that has been set as the admin. To contact the Reselling team, email us at reseller@axcrypt.net. In the left side menu, click and from the drop-down menu. On the creation page, enter your customer’s information and the number of licenses needed. This can be changed later but keep in mind that we have a volume discount per purchase. For VAT deduction (within the EU), enter a valid VAT number. The reseller’s discount and volume discount will be automatically added. After successful payment, you click from the left side menu. Choose the customer you have just created from the Acting On drop-down menu. Finally, you can add the email addresses of the users that need to be assigned a license. Note: It will work both if your customer does or does not have a registered AxCrypt account. They will receive an email or invite saying they have been added to a Business subscription. They must then activate their account. You will automatically be added to their subscription as an administrator of their account. Naturally, you will not be assigned a license. If you make any of your customer’s users an administrator, they will be able to purchase new licenses and manage the account. This means that you and they will not get the discount. We suggest not making them an administrator unless really needed. If any information has been filled in incorrectly during the creation, you can always change it by going to . This process is designed so it is completely managed by you and does not require any involvement from your customer (besides activating the account, should they not have an existing account yet), or from AxCrypt. If payment by bank transfer is preferred, this is possible too. See the billing tab for more information. You can add users to the customer’s account. Just be sure that unused licenses are available — the administrator can add users as long as there are licenses available. Click from the left side menu after logging in to the account web. Choose your customer from the Acting On drop down menu. Add users individually by their email address. Choose the number of licenses needed. Click to purchase the additional licenses. Note: If a payment by bank transfer is preferred, this is possible too. See billing down below for more information. When a subscription is created or renewed, the period is always a year. When additional members licenses are purchased for a subscription within the subscription period, only the remaining months rounded upwards to whole months are charged for. If 50 days remain for the current period, and additional members are added, this will be for 2 months/additional member. Click next to the user’s email address that needs to be removed or changed. You now have an unused license. You can either save it for when you need it (this doesn’t pause the expiration date) or assign it to a new user. 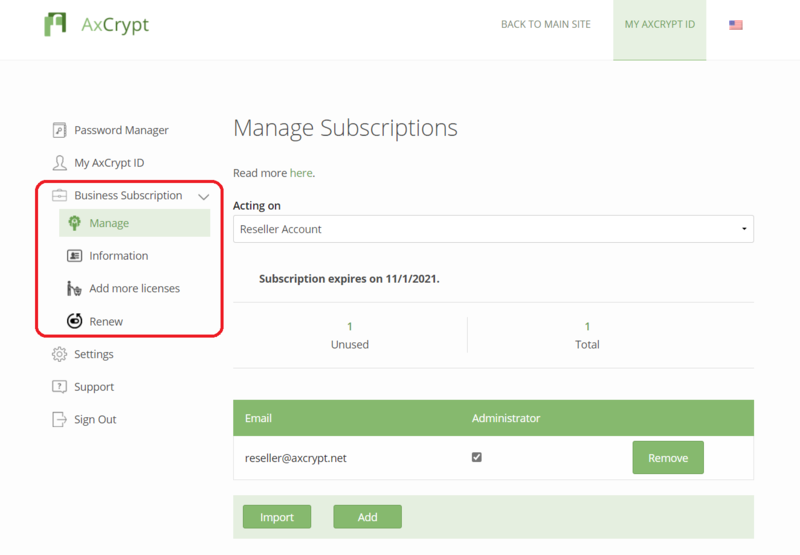 Subscriptions are purchased through AxCrypt web account portal (account.axcrypt.net). The payments are made directly through the portal with a credit card. It may also be possible for you to purchase by invoice, usually dependant on the number of subscriptions you wish to purchase. If you would like to do so, contact the Reselling team. If payment is done via bank transfer, it may take longer for your customer to get access, as we first have to receive the payment. For the purposes of a subscription a month is defined as 30 days and a year as 360 days. When a subscription is created or renewed, the period is always a year. We do not automatically renew subscriptions, so neither you nor your client will be charged automatically. Your customer will receive an email from us, by the time their subscription is expiring soon, just to let them know. When a subscription is renewed, the period is always a year. Here you will find your invoices and transaction history. Information such as date, reference, address, etc. You can print the invoice by clicking the print icon. EU VAT will be deducted before purchasing when entering a valid VAT number. VAT is not applicable for countries outside EU. For Swedish customers, VAT deduction is not possible. As AxCrypt is a Swedish company, Swedish customers will have to have to book the incoming VAT as incoming, and this is then deducted from outgoing VAT when they pay to Swedish Tax authorities. Note: AxCrypt can’t further advise you on tax matters. Please check your country’s regulations or contact your tax advisor for more details. Furthermore, technical support is available at support@axcrypt.net. Their time zone is UTC+5:30, and usually respond during office hours within a day. As a Reseller, you are responsible for your own sales and how you approach your (potential) customer. But, of course, we would like to assist you with your sales. Teamwork makes the dream work! For advertisement purposes, and to show to your customers, we have created a presentation and brochure of AxCrypt. It will explain what AxCrypt is and how it can help you to keep your data protected. Do not edit the images without our permission. Leave an empty space of 25% of the logotype dimensions from adjacent images or graphical elements. You may use black and white versions when the colored logotype isn’t a suitable alternative. You can find the original AxCrypt logotypes on https://www.axcrypt.net/press-media/.